As she and President Obama continue their European trek, the First Lady is constantly on the lips and within eyegaze of tastemakers and fashionphiles around the globe. Today Michelle O. faced the daunting challenge of being relentlessly snapped standing next to a supermodel. I think she came out quite well, although I do wonder if French First Lady Carla Bruni was intentionally slightly dowdy in her generous grey coat. Afterall, Michelle Obama’s star power is so intense at the moment that out fashioning her might come off as somehow distasteful. Am I wrong? Meanwhile designers are weighing in on the icon’s style choices during the European trip, and some are giving less then glowing reviews. Oscar de la Renta echoed the Cult’s disappointment in Obama’s meet-the-queen look saying, “You don’t…go to Buckingham Palace in a sweater.” I agree, Mr. de la Renta. The vet designer also seems miffed that the First Lady seems to have well-defined fashion favorites (Jason Wu, J. Crew) and they don’t include him. A valid point, I suppose. Considering that Michelle is having a bit of the Oprah-touch (formerly known as the Midas touch) on her chosen labels, it might do well for her to spread the wealth. But, hey, a Lady likes what she likes! 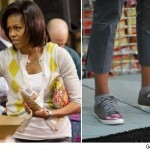 Michelle O’s Lanvin “Faux Pas” – Much Ado about Nothing! I loved hee in the Junya Wantanabe cardiagn.